Finding the halogen oven that's just right for you is no easy task - there are dozens of models to choose from and some hit the mark more than others when it comes to reliability, design, on-board features and additional accessories..
A cheap and basic oven may be up to the job if you only plan to use the device occasionally and don't really care if it's lacking some of the useful features which come with a more expensive deluxe model. However, you will probably want to spend a bit more for a better quality oven if you will be using it like a workhorse in your home to feed a family on a daily basis. We've come up with a few simple reviews of some of the ovens we consider worthy of spending your hard-earned cash on - these are models which have an excellent reputation and can be expected to provide a fulfilling experience of cooking with the power of halogen. We tell you all about the features of each model we review and some of the key areas that we believe make them a sound investment - we also provide a link to our shopping partner Amazon where you can find out more information about a particular model and read some feedback from previous buyers about their experience with cooking with the oven. Andrew James is a name you trust when it comes to halogen ovens - and their AJ-686GD model is an excellent device that really delivers the goods with regard to reliability and versatility. 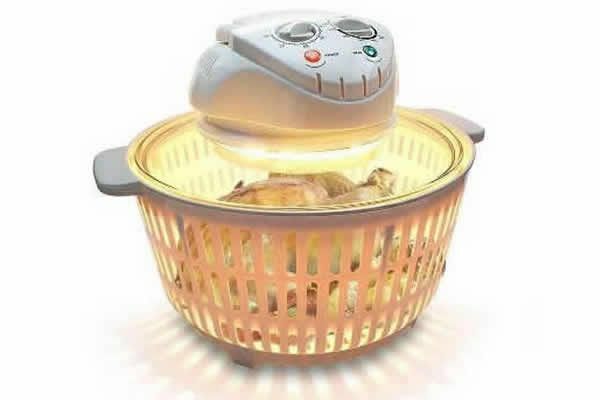 This cooker also comes with a range of accessories to let you get the best out of the oven, including two grill racks, tongs, a steamer tray and extender ring to let you cook large meat joints and full chickens. It also has a self-cleaning feature which is a must for anyone who wants the easy option of letting the device clean itself, rather than having to scrub clean the glass bowl yourself after use. Curries and casseroles turn out great in this unit and it's even proven a great device for teenagers starting to learn to cook simple snacks like cheese toasties and omelettes. The hinged lid is a bonus on this mini oven, meaning you don't have to place it on your worktop on a stand when removing cooked food. This 1400w oven has a large 12 litre glass cooking bowl making it easily large enough for most people. This oven has a great reputation for being very reliable but if you do ever need to contact the company with any enquiries about accessories or replacement parts, their after sales customer service is often praised for being very helpful and friendly. 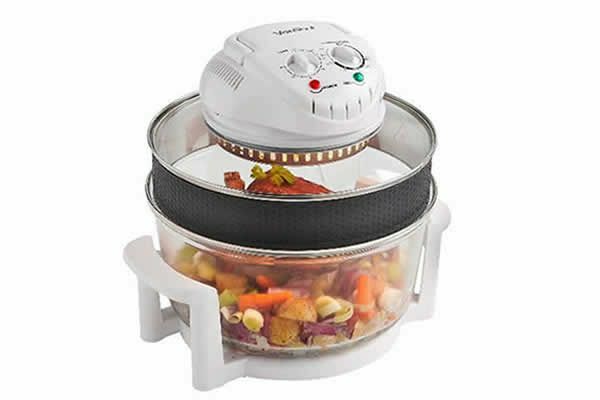 The Fine Elements Halogen Oven is great value for money, at around £35, and is certainly one to consider buying. 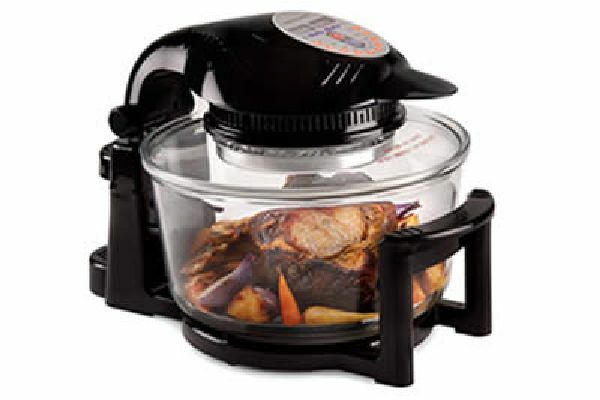 It has a 12-litre capacity glass cooking bowl, variable temperature control, a 60-minute timer and recipe book. This cooker also comes with the handy self-clean feature present on quite a few of the latest halogen ovens. This will save you having to manually scrub the bowl after use - just switch on the self-cleaning feature and let the device do it's thing. You may need to resort to a bit of elbow grease for particularly stubborn stains, but the auto-clean feature will do most of the hard work for you. The basket-style casing which surrounds the glass cooking bowl is a significantly different style to the metal cradle with handles featured on many other halogen ovens. This oven is sturdy and should serve you well for years if you look after it properly. Operating this halogen oven is very simple - just set the timer and temperature control, and then push the handle on the lid down to let cooking begin. The Fine Elements cooker has proved a very popular choice in the UK and is more than up to the job when it comes to your roasting, baking, boiling, grilling and frying needs. Here's a few comments from previous happy customers who bought this brand of oven. This stylish looking oven really takes some beating when it comes to all your halogen cooking needs. It's 12-litre capacity glass cooking bowl is easily large enough to take on most tasks when it comes to frying, steaming grilling, roasting, baking, broiling, defrosting and reheating. You even get a superb accessories pack with this top quality oven which includes an extender ring with a silicone protector to boost you oven capacity size, a frying pan, high and low metal cooking racks, oven lid holder, bread rack, an oven glove, skewers and tongs. These accessories are well worth having and will allow you to really get the best out of your oven. This unit's wattage ranges from 1200-1400w and it also comes with a detachable power cable and a self-clean feature which makes it really easy to clean the cooker after use. This is a really solid build oven which will stand up to any minor knocks in your kitchen - even the base unit to hold the glass bowl is made of metal, whereas some other models have a toughened plastic base. This oven has been getting plenty of positive feedback from previous happy buyers, although a few have commented that the holder for resting the oven lid on after use is a bit flimsy. Another minor criticism from some people is that the halogen bulb is extremely bright, hence this oven just misses out on a five star rating from us. Here's what a few buyer had to say about the VonShef Premium Oven 13/275. 'This is a fantastic oven - it's turned me into a really happy chef!